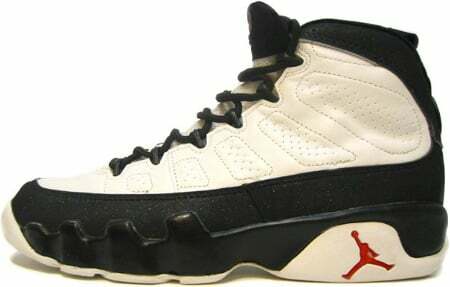 The first and popular Air Jordan Original 9 (IX) White – Black – True Red released November 1993, and sadly Michael Jordan retired before he could wear the Air Jordan OG 9 (IX) White, Black, Red or any other OG Jordan 9. Although Jordan did not wear the Air Jordan Original 9 (IX) White – Black – True Red other famous people did, like Tupac Shakur and later Eminem. Retail was $125, but nowadays you will have to fork out $300 plus.